Traun [ˈtʀaʊ̯n] ( Pronunciation ) is an Austrian city located on the north bank of the river Traun and borders Linz, the capital of Upper Austria, to the east. The name Traun is derived from the Celtic word for river (dru). 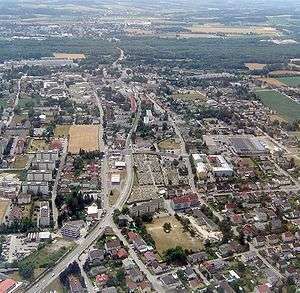 Traun is the fifth largest city in Upper Austria, located in the district of Linz-Land. 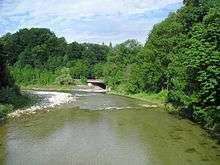 The Traun is a tributary of the Alz in Upper Bavaria. Traun ( Pronunciation ) is a river in the Austrian state of Upper Austria. Its source is in the Totes Gebirge mountain range in Styria. It flows through the Salzkammergut area and the lakes Hallstätter See and Traunsee. The Traun is a right tributary of the Danube, which it meets near the City of Linz. Other towns along the river are Bad Aussee, Bad Ischl, Gmunden, Wels and Traun. Any fly-fisher will enjoy fishing for the Traun's large grayling. The post office, the sports shop and small hotels in the nearby Hallstatt are a great source of information. This ancient lakeside village of some 950 residents has to be seen to be believed. Hallstatt is a World Heritage Site for its cultural heritage. Until the late 19th century, it was only possible to reach Hallstatt by boat or via narrow trails. However this secluded and inhospitable landscape nevertheless counts as one of the first places of human settlement due to the rich sources of natural salt, which was mined for thousands of years, originally in the shape of hearts. Some of Hallstatt's oldest archaeological finds, such as a shoe-last celt - a long thin stone tool used to fell trees and to work wood - date back to around 5000 BC.